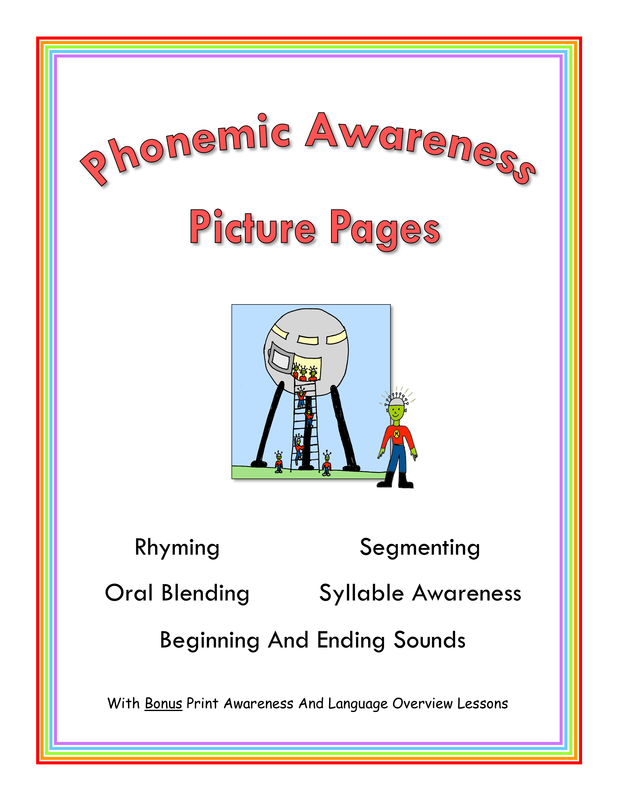 This section provides an overview of Phonemic Awareness PIcture Pages. To download the PDF file for this, look under the menu heading PDF FILES, click the sub-menu PDF FILES - BOOKS TO USE AT ANY LEVEL, and then choose PDF FILE FOR PHONEMIC AWARENESS PICTURE PAGES. Or, for a shortcut to that page, click here. Phonemic awareness instruction does not include letters or letter patterns. It focuses strictly on the sounds in words. The exercises in this book are done orally. Pictures are included to provide a visual reference and provide a way for students to record their answers. Some students learn to read without ever really understanding that words are made up of sub-units of sound. This book teaches students to listen for the individual sounds in words. It works on several related skills. Mastering these skills will help students read and spell words more easily. Oral Blending - The teacher pronounces the separate sounds in a series of words. Students listen, put the sounds together mentally, say the word, and find the related picture. Segmenting - Students are given a word and must break the word apart into its separate sounds. Students identify which pictures begin with a specific sound. Students identify which pictures end with a specific sound. Students identify which pictures have a specific short vowel sound. Students identify the number of syllables in words. ​This book can be used with two types of students. Students who have not yet started to read, who are not using the Learning The Alphabet or the Exploring Sounds In Words books. Students who are already reading but they are having difficulty with word recognition skills and comprehension skills.